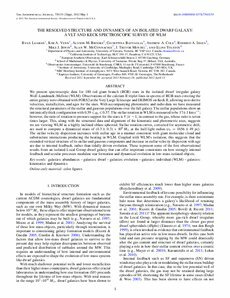 We present spectroscopic data for 180 red giant branch (RGB) stars in the isolated dwarf irregular galaxy Wolf-Lundmark-Mellote (WLM). Observations of the calcium II triplet lines in spectra of RGB stars covering the entire galaxy were obtained with FORS2 at the Very Large Telescope and DEIMOS on Keck II, allowing us to derive velocities, metallicities, and ages for the stars. With accompanying photometric and radio data we have measured the structural parameters of the stellar and gaseous populations over the full galaxy. The stellar populations show an intrinsically thick configuration with 0.39 ≤ q0 ≤ 0.57. The stellar rotation in WLM is measured to be 17 ± 1km s-1; however, the ratio of rotation to pressure support for the stars is V/σ 1, in contrast to the gas, whose ratio is seven times larger. This, along with the structural data and alignment of the kinematic and photometric axes, suggests we are viewing WLM as a highly inclined oblate spheroid. Stellar rotation curves, corrected for asymmetric drift, are used to compute a dynamical mass of (4.3 ± 0.3) x 108 M⊙ at the half-light radius (rh = 1656 ± 49 pc). The stellar velocity dispersion increases with stellar age in a manner consistent with giant molecular cloud and substructure interactions producing the heating in WLM. Coupled with WLM's isolation, this suggests that the extended vertical structure of its stellar and gaseous components and increase in stellar velocity dispersion with age are due to internal feedback, rather than tidally driven evolution. These represent some of the first observational results from an isolated Local Group dwarf galaxy that can offer important constraints on how strongly internal feedback and secular processes modulate star formation and dynamical evolution in low-mass isolated objects.